The Audience tab displays information on your audience demographics, such as age, gender, and location. This allows you to learn more about the people that matter to your business, and in turn, create content most suited to them. Start by selecting the social network you'd like to analyze on the left hand side of your dashboard, and then selecting the Audience tab. If you have multiple social accounts of one network (e.g. multiple Facebook accounts), you can change the account at the top, as well as the date range you'd like to analyze. All data can be exported as both CSV and image files using the Export button. You’ll notice an Add to Report button at the top right of each table and chart. Learn more about creating custom reports here. 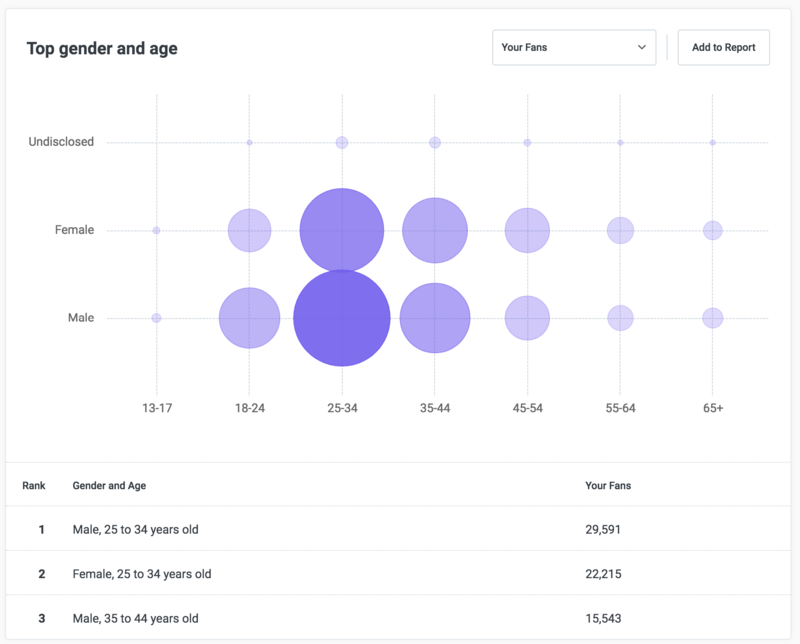 The audience overview chart shows your top demographic by gender and age, as well as your top location. If you're looking at a Facebook Page, you'll also be able to toggle between analyzing Your Fans or People Reached, using the drop down towards to the top right of the chart. The top gender and age chart displays a bubble chart of females and males, by age. Below the bubble chart, you'll see your top three ranked demographics. If you're looking at a Facebook Page, you'll also be able to toggle between analyzing Your Fans or People Reached, using the drop down towards to the top right of the chart. The top cities chart displays the top five cities where your fans are located. Below the chart, you'll see your top three ranked cities. 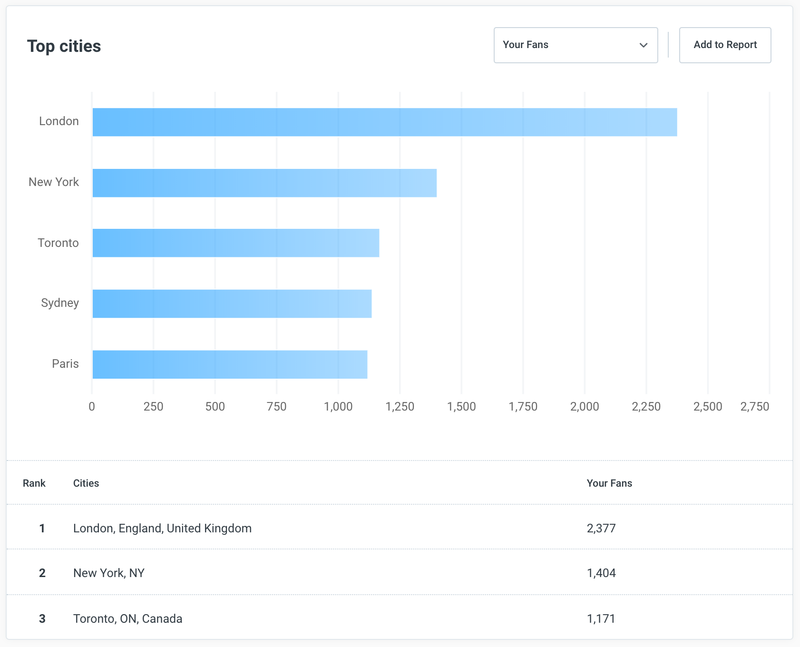 If you're looking at a Facebook Page, you'll also be able to toggle between analyzing Your Fans or People Reached, using the drop down towards to the top right of the chart. 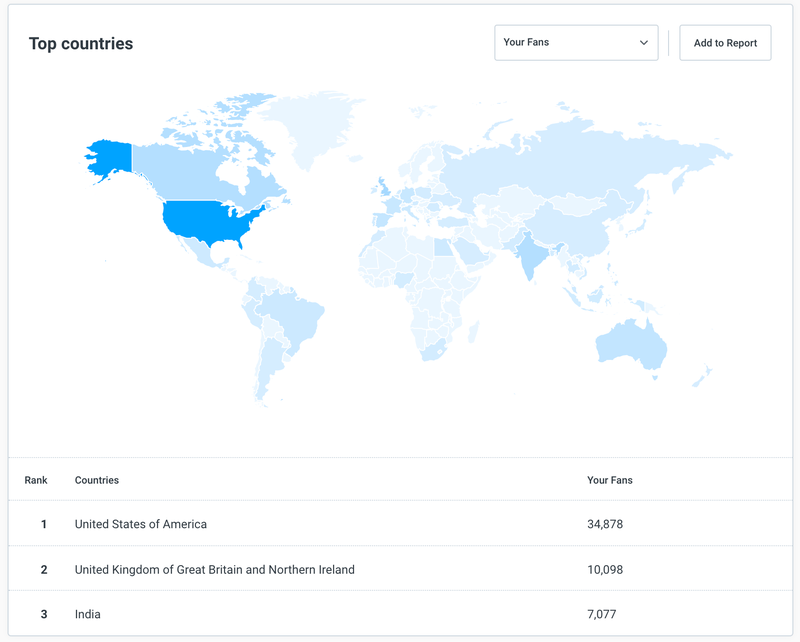 The top countries chart displays a map of where your fans are located. You can hover over areas on the map to see the number and percentage of fans. Below the map, you'll see your top three ranked countries. If you're looking at a Facebook Page, you'll also be able to toggle between analyzing Your Fans or People Reached, using the drop down towards to the top right of the chart.